When I first set up this web site, I outlined the rationale for my strategy to focus on emerging junior gold producers in the first post titled, "Why Near Production Junior Gold Miners?" It is important to occasionally remind readers of the rationale of the strategy, especially when the emerging junior gold producing company share prices tread water. The following chart illustrates the life cycle of a junior mining stock with the share price on the Y axis and chronological time on the X axis. 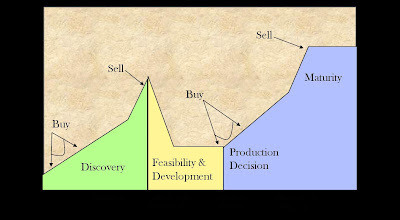 The first stage of a junior miner is the discovery stage. This is the stage where companies are identifying resources and proving up the resource if the preliminary data from the drill cores look promising. Many companies see a sharp rise in the share price as they prove up resources and many junior mining investors like to pick up companies at this stage. If the resource proves up, these investors can make a lot of money. During the second stage in the life cycle of a junior mining company, the resource must be assessed to see if it is economically feasible. Share prices often move down during this stage. There is a lot of work (and risk that the resource fails feasibility) that goes into this assessment. Important items include the projected price of gold, projected cost of production, the grade of the ore (how much mineralization is in the rock), and available infrastructure (road access, mill construction, etc.). Development includes engineering and geological activities such as geologic modeling, ore reserve estimation, geostatistical data analysis, pit/underground mine optimization mapping, pit/underground mine design, detailed mine planning, continued exploration planning, mining method optimization, mill design and construction and several other actitivites. The next stage begins with the decision to produce and commencement of production. In practice, this stage overlaps with the development stage as mill construction follows the decision to produce. The key point in this stage from an investment standpoint is between the decision to produce and the first pour. Overlaps also exist between the discovery stage and the production stage as many junior gold miners commence production before they fully prove up the entire resource. In addition, the acquisition of nearby properties with promising resources are often turned into proven reserves while production is expanded. The risk of failure for companies that have not yet commenced production is extremely high. Companies that have executed well on identifying resources and moving into production have a lower risk profile because they have proven their ability to bring a project to profitability. My preference is to invest in emerging junior gold producers that have just commenced production, have a rich resource base of operations, and either own several properties or have a wide sphere of nearby potential properties they might acquire or develop an arrangement to process the reserves. Junior gold miners in the pre-production or early production phase can also be a hedge against a falling gold price. Mining is a risky business. A lot can go wrong. But the reward to risk ratio is better for emerging gold producers over the next 6-18 months than many other investment options in my opinion. There are other important characteristics I look for in an emerging junior gold producer, but these are the major considerations related to the life cycle of a junior gold miner. Doesn't mention financing. This is critical to exiting the advanced development stage and starting the production phase. Seems really important whether a Jr gets and what kind of financing it is. How about writing a piece about financing the effect of warrants on stock price? Also, how about updating your graph (and discussion) with a clear indication of where in the graph you think good entry (and exit points) are available. Also, how about providing a good exemplary graph of a stock that has successfully navigated the pattern. Finally, my experience says that that there is a good "anticipation" runup to the production announcement and then its usually downhill for a quarter or two as startup problems lead to disappointing financials. Love your web site and hope this is helpful. Great points Monty! I agree with them all. Financing considerations and pre-production runup are important items to pay attention to when investing/speculating in emerging junior gold producers.